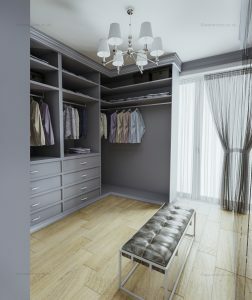 Bespoke walk-in wardrobe is a small or large dressing room that is customised according to the provisions of the house and preferences of the owner. It allows you to enter the closet and conveniently select and try out clothes and shoes. It also has its own vanity space where you dress up, check how you look and find your perfect outfit. A bespoke walk-in wardrobe is a common and important component of the house especially for celebrities/ personalities, models and fashionistas who are compelled to be mindful of their public image and appearance. The bespoke dressing room can vary in size. It can be as big as one full room or half the size of the bedroom. When planning your dressing room you should take into consideration that there has to be a walkway clearance to make all storage shelves and hangers accessible to you. Storage and hanging placement should be specifically planned to ensure organisation and proper arrangement or garments. A bespoke walk-in wardrobe can bring a lot of benefits to you. Firstly, it allows you to better organise your clothes, which is one of the most common items that cause house clutter. Secondly, it saves you time to dress. Dressing up in your bespoke dressing room gives your convenience of having all clothing you want to try and combine within your reach. Thirdly, a walk in designer wardrobe provides you added privacy. Finally, it allows for easier way to clean your things. Having sufficient space for your clothes is always better so that it wouldn’t look cramped and it easier for you to find your stuff.